A rich, sweet, and creamy cup of pink velvet hot chocolate makes the perfect treat for a chilly winter night. 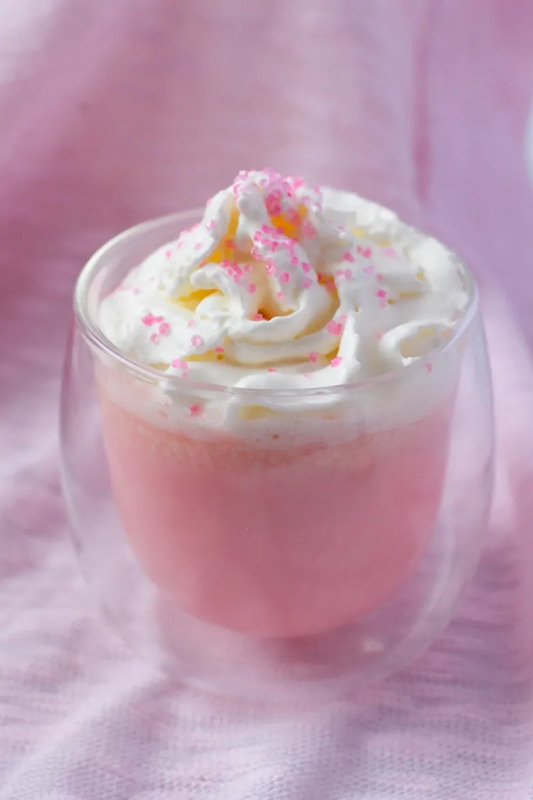 This tasty pink hot chocolate would also be just perfect to serve on Valentine's Day! Happy New Year's! I hope that everyone had a fun and safe New Years Eve! Hubby and I stayed in and kept it low key. It was actually the first New Year's Eve that I can recall that I feel asleep before the ball dropped! I know, I am getting pretty lame. What can I say? I was tired! Anyways, now that we are out of the Christmas season, we are moving on to get ready for the next major holiday – Valentine's Day! Boy do I have the perfect Valentine's Day treat for you today! 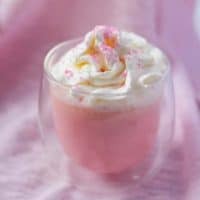 A fun twist on traditional hot chocolate, this pretty pink velvet hot chocolate is so delicious and indulging, you are going to want to drink a cup of it every night. 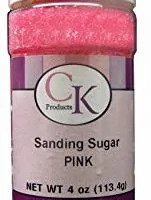 Additionally, you can use a bit of pink food coloring like we did to give your hot cocoa some extra pink coloring. Of course, the pink food coloring is entirely optional. 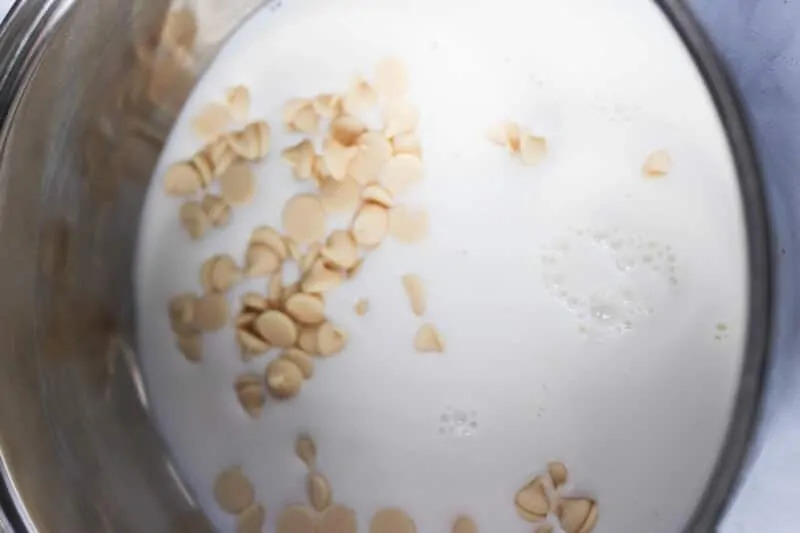 To start, warm up the milk in a medium saucepan over medium heat for 2 minutes. Whisk in the vanilla and cream cheese until melted. Then, whisk in the white chocolate until melted and smooth. 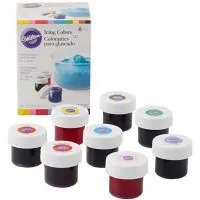 Add the strawberry syrup or puree last, and adjust the color as desired with the food coloring. Finally, ladle the hot chocolate into your serving glasses and add a garnish of whipped cream and pink sanding sugar. That is it. 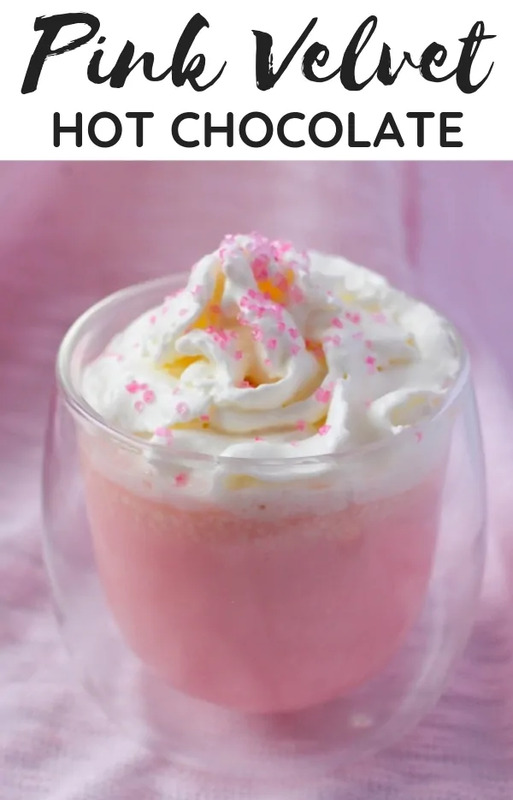 Enjoy your beautiful pink velvet hot chocolate. Rich, sweet, and creamy pink velvet hot chocolate perfect for a chilly winter night or on Valentine's Day! 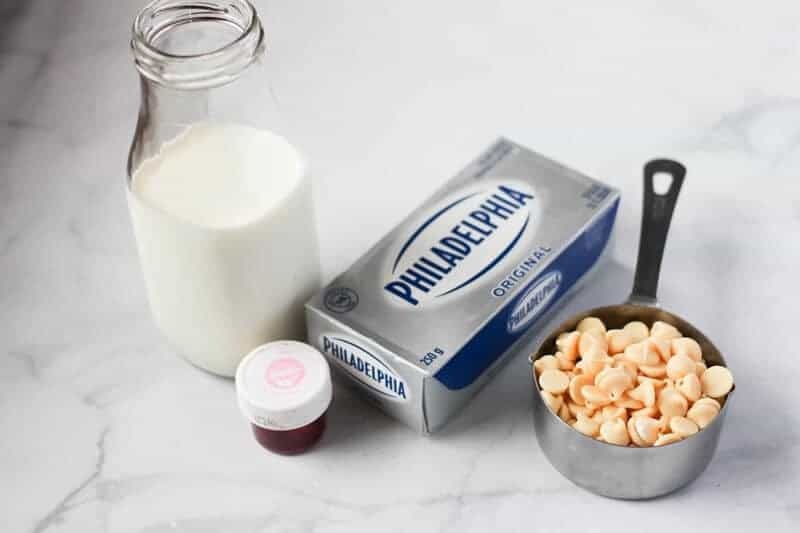 In a medium saucepan, warm up the milk over medium heat for 2 minutes as you assemble the ingredients. Whisk in the vanilla and cream cheese until melted. 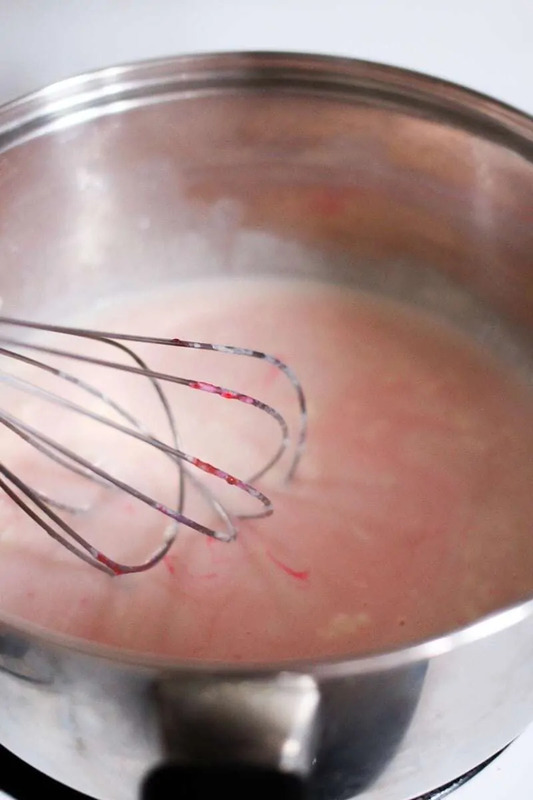 Whisk in the white chocolate until melted and smooth. Add the strawberry syrup or puree last, and adjust the color as desired with the food dye. 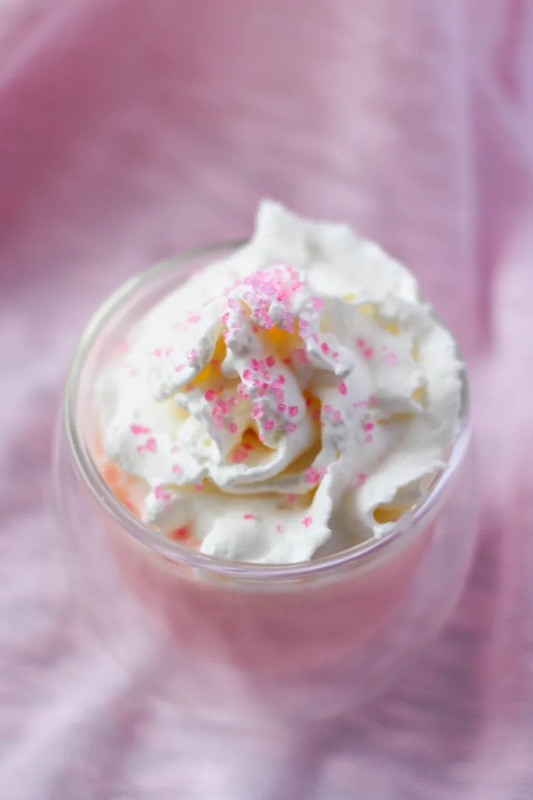 Ladle into your serving glasses and add a garnish of whipped cream and pink sugar. This recipe is shared at Meal Plan Monday and The Weekend Potluck. Liquid cream cheese! Whoa! Sounds decadent. Thanks so much for sharing the recipe! Looks so tasty. I will be making this on Valentine’s and many other occasions as well. Oh my gosh I LOVE this recipe! I am so making this for my kids for Valentine’s Day. Thanks! I love chocolate and I love your receipt. This looks really tasty! Thanks for sharing! I need to get the ingredients to make this. This sounds amazing, I have to try it! I adore the colour of this hot chocolate! It looks amazing! Yes perfect for Valentine’s day! WOW! This drink looks pretty and fun. I know what you mean about how fast we move from one thing to the next ie Christmas then Valentines Day! I know some kids that would enjoy this. How cute is this?! I would have never guessed there was cream cheese in this hot chocolate, but I bet it adds a really delicious flavor and creamy-ness.